Later topic: THE C&P! AT LAST! 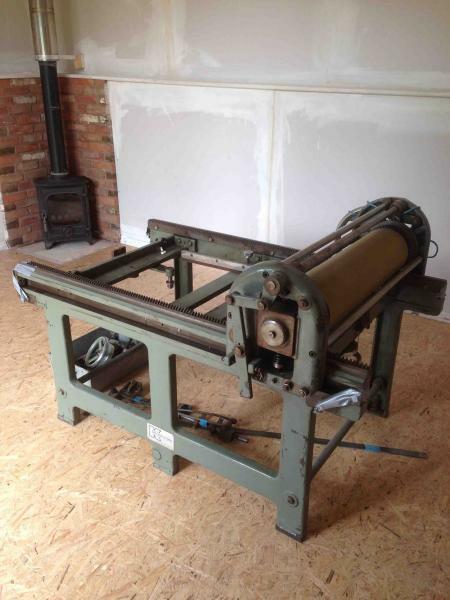 I have recently got hold of a Litho Proofing Press (part- assembled) and am in the process of fixing it back together. It was made in 1960 made by Nakanishi of Japan. We have all the parts but are unsure about which way the beds should go and about the foot operated clamp. Does anyone have any Technical Diagrams/Manuals relating to any make of Litho Proofing Press? Any advice or links to relevant material will be gratefully received. You might try posting this question on the Facebook Forum of Building and Restoring Artists Printmaking Presses. Quite a few very knowledgeable members. Maybe one or two are familiar with litho. Regarding the link below, it’s not the same press of course, and has no dampening system, but the offset style of proof press which the ink makers use today, is the Little Joe. This is an offset press, but not a lithographic press. I wonder if this press has the same basic design and functionality as yours, or if your press is actually a lithographic press with a dampening system. For what it’s worth, the definition of a direct press is that it prints directly from the plate to the substrate (paper). An offset press prints (or offsets the image) to an intermediate cylinder, and then transfers the image from the intermediate cylinder to the substrate. He has worked on similar european presses and might be able to point you in the right direction; that website has his contact info on it. If you get in touch with him he’ll at least be able to tell you about other presses that are similar. Also, I’ve always wanted one of these! I’m very jealous, I hope you get it put together! My guess is that there are two flatbed sections, one for plate (clamped), and another for paper (gripped). Rubber blanket on the cylinder. Plate would be hand-dampened and -inked.